Trees are a wonderful part of nature which provide many benefits including fresh air, shade, and a natural coolant. Having a tree or two around your home can be good, especially when it complements your landscape, however, old and unhealthy trees can be a potential hazard to the safety of your family and your home. When a tree starts to wither or has already reached an age where it has weathered many years of storms and use by animals, its heavy branches may fall off, and when they do, they are likely to cause injury or property damage. When you’re looking at a tree in your front or backyard, some limbs or branches may look perfectly fine and healthy from afar. However, these branches or limbs may already be rotten on the inside and may fall at any given moment. A professional tree remover can spot these rotten limbs, and can even distinguish healthy branches from unhealthy but seemingly-fine ones. Tree removal requires a lot of tools, and of course, the expertise in handling these tools. Now you may have purchased a new, state-of-the-art chainsaw, but being inexperienced in handling it properly may only cause serious injuries. Professionals are trained to handle even the most dangerous tools in tree removal and not to mention, they also have the right safety gear and equipment in order to perform a thorough yet safe job. At a glance, removing a tree may just be an easy task, however, it is one that requires a lot of time, energy, and patience. Removing an average tree safely can even take up to 4 hours. This is a lot of time spent on a grueling—and dangerous—task. With professional tree removal services, however, you can rest easy knowing that the task is handled by experts and that you don’t have to move a muscle. AJ Tree Service is a trusted provider of landscaping and tree service in Broken Arrow, Oklahoma. 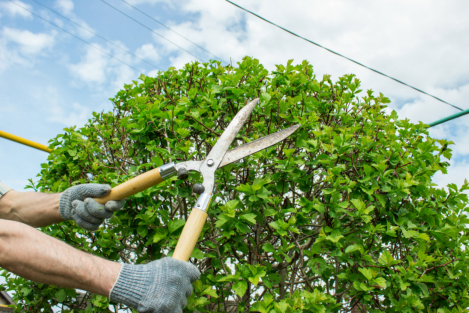 We offer a wide array of services for your tree maintenance and landscaping needs—from pruning and trimming trees, plants, and hedges to tree planting and landscaping. We aim to help you improve the state of your property—be it residential or commercial—and provide you with a lawn or backyard that are well-suited to your taste and personality. This entry was posted in Tree Removal and tagged landscaping services, tree cutting, Tree Maintenance. Bookmark the permalink.